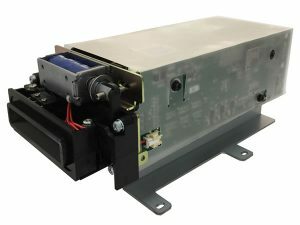 MTK-R50 is the motorized card reader and encoder that works for magnetic, IC and RFID cards. For magnetic, it supports both hi-co and lo-co options. The machine is designed smartly for abnormal card rejection and anti-skimming. Multiple shutter and communication options are available. And E-shutter are specially designed for anti-skimming and anti-fishing. MTK-R50 is applicable for various self service terminals such as bill payment kiosks, ticketing systems and other kiosk stands.